Bring it! IMAX and Marvel have announced a special "IMAX 3D First Look" event for Guardians of the Galaxy, where they will be showing 17 minutes of footage. Yep, another one of these previews right before the movie hits theaters. The event takes place on July 7th (a mere 25 days before it hits theaters) at 7PM at various theaters around the country - tickets are available first come, first serve on this website here. This free sneak peek will be showcased in 150 IMAX theatre locations across North America, and fans will receive an IMAX poster as well. Thankfully, the artwork for this looks awesome, and may make the trip out to see 1/10th of a movie worth it. The art, the colors, all of it looks just fantastic, can't wait to see this. View below. Here's the new IMAX poster below. Click right here for the full list of IMAX theaters and info on the event. 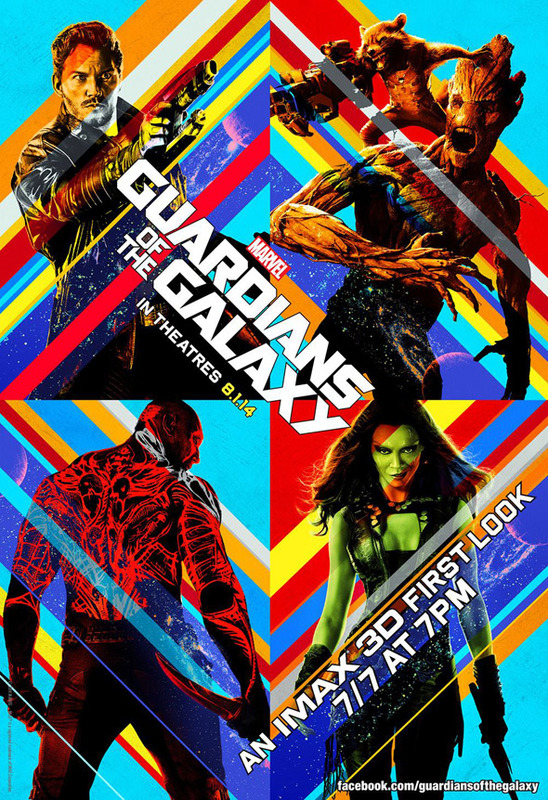 Fans who attend will also receive a collectible Marvel's Guardians of the Galaxy IMAX poster (seen above). I got "tickets", but the fine print says: "The screening may be overbooked and seating is not guaranteed." Then why are they calling it a ticket? They must be hedging on the fact that since it's free people will sign up and not show up. So I wonder if I need to show up super early to ensure I get in. Though they also mention to inform them if you change your mind about attending to release your "tickets." I would show up super early. That's what I'm doing. This is a smart move. They need to take extra steps in order to build up word-of-mouth for what is essentially an "original" property. I really like this poster design so much more than the official ones. It's as cartoony as I hope it's going to be, while still promising some good action. The official posters could be for Jupiter Ascending or something upon first glance--pretty bland. Love the poster... Cant wait to see this movie. Love that OP piece that nailed the marketing for this film: they are selling as anything but what it is. And I think that is genius! Fans will recognize the beats and non-fans will get hyped and hopefully pleasantly surprised in theaters. Mmmmm....closest place is 90 miles away from me; I think i can wait till August.